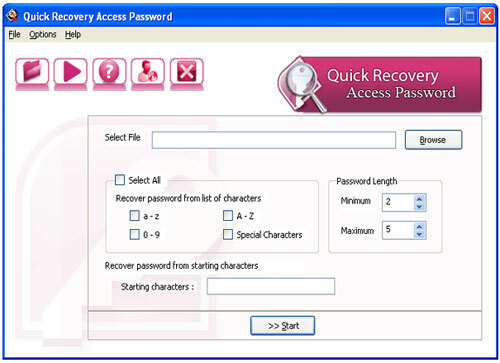 Quick Recovery Access Password is the most adequate, user amicable and result confound Access Password Recovery Software. This Software gives across the board access to recover Microsoft Access document type (*.mdb, *.accdb) file-opening passwords. The Software recovers the entire password (length and complexity do not make any effect on this software) of Access workbook. It recovers the entire password whether the password is Numeric, Alpha-numeric or has special characters in it. The program supports all versions of Microsoft Access, i.e. Microsoft Access 2010, Microsoft Access 2007, Microsoft Access 2003 and Microsoft Access 2002(XP). 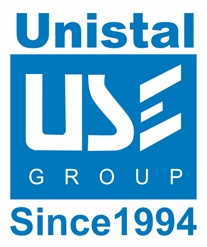 The software is widely used to recover, break, crack, find, unlock & retrieve lost or forgotten Access password. Recovers Access password from encrypted Access files. Instant recovery of Microsoft Access workbook passwords regardless of their length and complexity (*.mdb, *.accdb). Provides various parameters that help narrowing down the search for Access password. Recovers the password to access as well as the password to modify the MS Access workbook. Quick Recovery for Access Password instantly recovers shared workbooks protection and read-only permissions. Define the minimum and maximum number of characters that the password may contain. Creates and uses an in-built dynamic dictionary that provides more precession in tracking the lost password. Starting characters option provides the initial character(s) of the password if you know or remember it somehow. A number of unique features, such as accounting for possible types when typing the passwords for the given keyboard layout. Access Password Recovery Software supports all versions of Microsoft Access, including Microsoft Access 2010, Microsoft Access 2007, Microsoft Access 2003 and Microsoft Access 2002(XP). Uses the 'Brute Force Attack' mechanism to ensure the password recovery with 100% success rate. Comprehensive help file, context help. Operating System: Windows XP/Vista/Windows 7/ Windows 10 /WIndows 8, Windows Server 2003/2008. 50 MB available Hard Disk space. Selecting or browsing file is the first step to recover password of Access file. Select password protected Access file to recover the password of mdb database. You can specify the search by selecting the length of the password, first character of the password; you can also specify the set of character. This software uses Dictionary attack method and Brute force attack method to break the security and recover the password. Once the attack is complete, "Quick Recovery Access password" displays the results of the password recovery process in the Password Found Report. This is the way this software works. Why use Quick Recovery for Access Password? 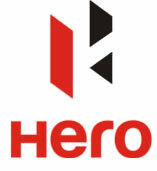 This software is used to recover the password of Access files. You can recover the password of Access file in case of misplacement or forgotten password. You can recover the password in case some other user has set the password and has either left the organization or is unavailable. You can also recover the password if you have recently changed the password and do not remember it now. If you don't have any clue of the password, then also you can recover the password.